With the holiday season coming up, it’s important to be careful with what you eat. Go ahead and enjoy your favorite treats, just make sure you take care of your teeth after you eat. Sugary treats can cause bacteria to thrive in your mouth, leading to cavities and other oral health problems. In fact, too much bad food can leave you needing serious cosmetic dentistry in Atlanta. To help you figure out what you should be avoiding this season, here are a few foods and beverages that can cause damage to your teeth and leave you calling your cosmetic dentist in Atlanta. Although candy canes taste as refreshing and minty as toothpaste, they’re incredibly bad for your teeth. Since it takes a long time for one to finish a single candy cane, the entire time you’re licking it, your teeth become coated with sugar. This sugar can stay on your teeth for a long time until you brush it off. The longer sugar remains on your teeth, the more bacteria can spread in your mouth and cause decay. It’s very likely that you’ll be drinking a lot of alcohol throughout winter. You have to keep the amount of liquor in check, though, not only to avoid health problems but also to protect your teeth from the effects of alcohol. Excessive drinking without brushing can cause teeth staining or discoloration. Some drinks have sugar content too, so there’s a risk of cavity entailed by intoxication. 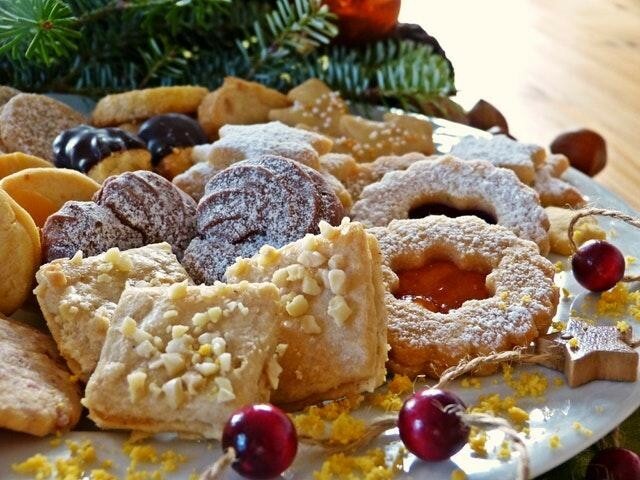 If you eat sugary baked goods this Christmas, such as cake, cookies, and brownies, and do not improve your oral hygiene, chances are you’ll have cavities by the end of the season. Baked goods are well-known for their high sugar content. This sugar can sit on your teeth for an extended period, causing bacteria to spread. Before preparing sugary baked goods this holiday season, remember how brushing and flossing can keep your mouth free of cavity-causing bacteria. Eggnog is a popular holiday treat. Like other treats, however, it also contains a significant amount of sugar. Just a single cup may have up to 20 grams of sugar. Not only is this bad for your diet but it can also damage your teeth. After drinking a glass of eggnog, drink a cup of water to wash it down, as recommended by dentists. This will prevent bacteria from spreading in your mouth. Potatoes are very rich in starch, which can stick to your teeth like sugar. When you eat mashed potatoes, pieces can remain on your teeth and form plaque, which is the main breeding ground for bacteria in the mouth. To avoid needing cosmetic dentistry in Atlanta, eat potatoes in moderation. Also, drink plenty of water with your potatoes and brush your teeth after finishing. Though citrus fruits like oranges, lemons, and grapefruits can have a number of health benefits, they can also cause harm to your teeth. Over time, these fruits cause enamel erosion due to the acid in their juices. As your teeth corrode, the sensitive layers become exposed, leading to sensitivity issues. Severely corroded teeth also lose their strength, thus affecting digestion. Before you dig into that big tin of popcorn, consider the risks that your teeth may face. Popcorn kernels can get stuck in between your teeth and remain there for hours or even days. This makes a nice treat for bad bacteria. After snacking on some popcorn, be sure to brush your teeth to get rid of all the food stuff that can invite bacteria. If you want to enjoy these foods and all other delicious treats that are available only during the holiday season, make sure to maintain a healthy oral hygiene. It also helps to visit your dentist for checkup and cleaning every now and then throughout winter.